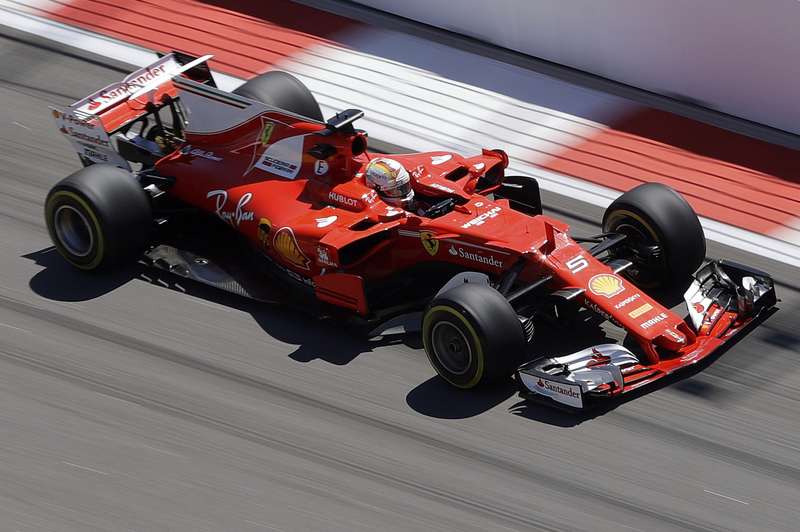 Sochi, Russia (AP) — Formula One leader Sebastian Vettel recovered after a spin in the first practice session Friday and set the fastest time of the day ahead of this weekend’s Russian Grand Prix. On a track which had been widely expected to favor Mercedes because of its long straights, Vettel set a time of 1 minute, 34.120 seconds in the second session. That was .263 seconds faster than Ferrari teammate Kimi Raikkonen and 0.670 seconds ahead of the first Mercedes of Valtteri Bottas. Lewis Hamilton was further back on a warm, dry day at the Olympic Park. Vettel added that he needs time to reacquaint himself with the Sochi Autodrom because a lack of trackside features means it is hard to judge his approach to corners. Max Verstappen held onto the fifth-fastest time even though his Red Bull broke down with about 20 minutes remaining. Raikkonen led the first session with a time of 1:36.074, narrowly ahead of Bottas and Hamilton. Verstappen was fourth and Vettel fifth following his spin. Renault test driver Sergei Sirotkin was given a rare run in the first practice session, but the car broke down before he could set a time. The session was briefly red-flagged when the engine cover flew off Esteban Ocon’s Force India car on a high-speed section. There was more misery for McLaren driver Stoffel Vandoorne as he picked up a 15-place grid penalty for exceeding his allowance of various power unit components. The Belgian, whose best qualifying result this season was 16th in China, is almost certain to start Sunday’s race from the back of the grid. With an underpowered and unreliable Honda engine, McLaren hasn’t scored a point in three races this season. Vandoorne’s 13th place in the opening race in Australia last month is the only time this season that a McLaren car has reached the checkered flag.